We have a small half bathroom for guests. As a kid, I remember a similar room being called a "powder room." Powder room basically meant - don't use it - we need to keep it clean for company. Anyway, the powder room at our house has a pedestal sink and no storage at all. So, while I was packing up Christmas, my mind wandered to how I could improve the little bathroom. Then it came to me. 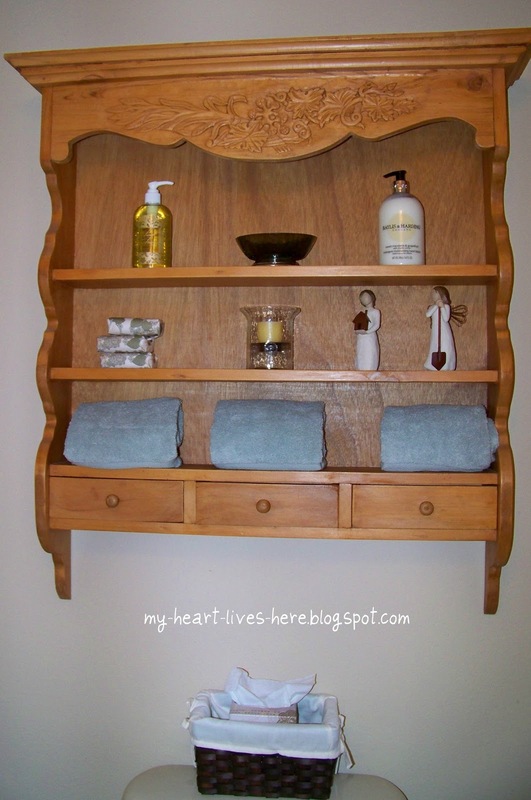 I have been storing a pine shelf in guest room closet ever since we moved to this house. The shelf was perfect in my old kitchen. I purchased it at Round Top and had a bruise on my hip for about a month from carrying it back to the bus we traveled on. It just didn't fit in my new kitchen. But I digress. I went to measure the shelf and my bathroom and guess what - just the right size! This picture really doesn't do it justice since I can't get the camera far enough away. The little drawers are also handy for tucking away personal items. Not bad for shopping my own closets. I love your pine shelf. 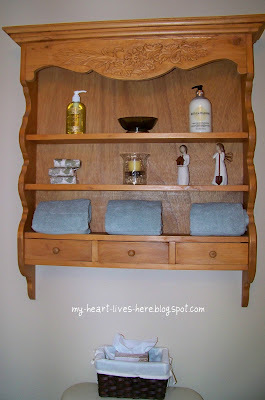 It is perfect in your powder room.